This delightful two bedroom home is situated on a small friendly complex in a quiet residential area of Konia village, within walking distance to local amenities. ​Many choose Konia for the traditional village way of life and convenient location. The centre of Paphos and the coast are a short, easy commute and for keen golfers there are four excellent courses within a 10 to 15 minute drive. The property is very well maintained with good quality finishes throughout and being a permanent residence features many additional home comforts, including a fabulous log burner fire for the cooler months. ​The ground floor accommodation features a bright, open plan living room with cosy lounge, formal dining space and modern fully fitted kitchen. Sliding patio doors from the lounge provide easy access to a private outdoor terrace and gated driveway. The kitchen is well equipped with dark wood units and quality granite worktops/splash backs. Appliances include a built-in oven, electric hob and extractor fan, fridge/freezer and slimline dishwasher. A guest toilet and under stairs storage cupboard housing the washing machine are located to the side of a beautiful marble staircase, which lead up to the first floor bedrooms and contemporary style bathroom. Both the master and second bedroom are double size with fitted wardrobes and shutters and the master also benefits from private access to a Juliet style balcony, from where you can enjoy rural and horizon sea views. The complex has a central communal leisure area including swimming pool with roman steps, fully tiled sunbathing terrace plus toilet, shower and changing room facilities. In addition to the private gated driveway, there is an allocated covered parking space to the rear with a generous size workshop/outdoor store room with power supply positioned to the side. 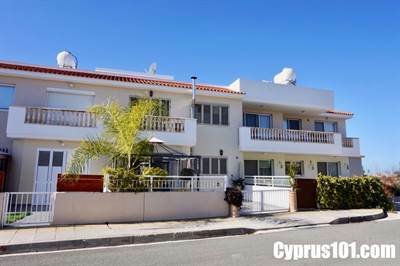 For those looking for a permanent residence or holiday home in a quiet traditional village setting, close to all the amenities of Paphos, this property certainly has lots to offer. There are full title deeds.